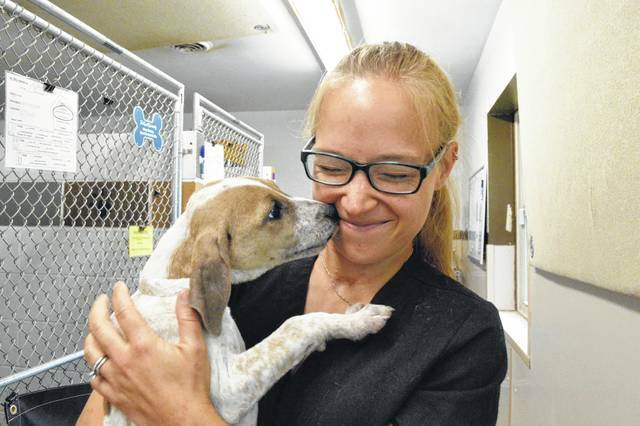 Natalie Yeager, canine intake coordinator at the Humane Society of Delaware County, gets a puppy kiss from Jumper, one of the 41 puppies delivered to Delaware from animal shelters in Texas. Yeager coordinated the transportation with a Houston rescue group. These are some of the 41 puppies delivered to the Humane Society of Delaware County from animal shelters in the Houston, Texas area. The puppies have been sent to foster homes while they await adoption. Natalie Yeager would count the number of stray dogs each day on her way to work at the animal shelter in Houston, Texas. On average, she would see about five dogs. With about 1.2 million stray dogs in Houston, Yeager said the shelter was “overrun,” receiving about 80 dogs and cats on daily basis. Yeager left the Houston animal shelter last fall to take a position as the canine intake coordinator at the Humane Society of Delaware County. But her Lone Star State connections helped the local shelter secure 41 dogs — each four years old and younger — last week that were on the list to be euthanized in Houston. Eight of the puppies were adopted last weekend with another four dogs adopted Wednesday. Shelter officials planned to spay and neuter six dogs — if necessary — on Thursday to be ready for adoption this weekend. “We’ve had so much interest we’re not accepting applications until they’re ready to go on the floor,” Yeager said. 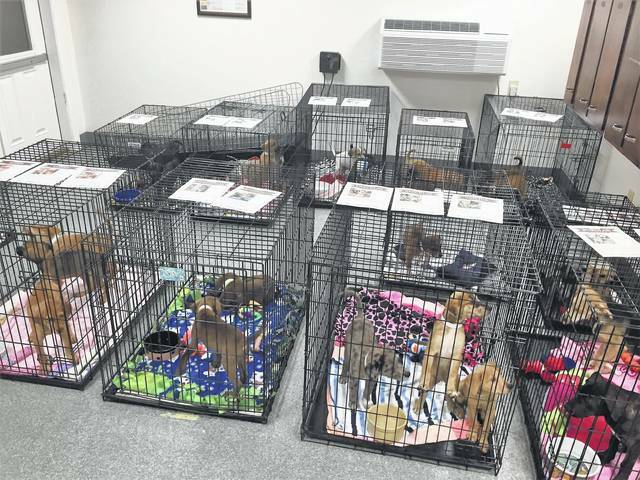 The Delaware County animal shelter was actively searching for puppies because of high demand locally. Interim Executive Director Jana Cassidy said there was a gap in what the shelter offered and what was requested by the public. “That kept coming up time and time again,” she said. Yeager said summer is the time of year when families feel it’s okay to get a puppy because children are out of school. During her search, she saw some social media posts from Texas-based K-9 Angels Rescue about the need to find homes for puppies housed at the Houston and Liberty County shelters. She jokingly offered to take some of the puppies with the shelter’s van. But the conversation turned serious when the group asked how many puppies the Delaware shelter could accommodate. The rescue group rented a truck and borrowed a trailer with built-in kennels to transport the 41 dogs. The four-person crew departed Houston at 10 p.m. June 26 and drove roughly 1,200 miles in about 24 hours to deliver the puppies. “They had to take make a stop every so often (for breaks),” Yeager said. Cassidy said it was unusual for their shelter to get puppies this way. Most of the puppies are at different foster homes and will be brought to the shelter in batches of eight to 10 over the next few weeks, she said. “The plan is to give these puppies the chance to decompress,” she said. The puppy express made the trip at no cost to the Delaware shelter. The application process will be different for the Texas puppies. The shelter will only accept in-person applications, according to its website. The puppies will be available on a first come, first serve basis. Families must bring their other dogs for a meet-and-greet with the new puppy. ​Pictures will be posted on the Delaware shelter’s Facebook page at www.facebook.com/humanesocietydelawareco. Information can be found at www.hsdcohio.org/texas-puppies. Cassidy said the new supply of puppies won’t quell local demand, though.